Posted May 2, 2013 by Nate Beaty & filed under Past. Edie Fake, Rinko Endo, Kathleen McIntyre, Ramsey Beyer, Liz Prince, Dina Kelberman, Sara McHenry, and more. Care is a disquieted state of mixed uncertainty, apprehension, and responsibility; a suffering of the mind; painstaking and watchful attention, maintenance, charge, and supervision. Self-care and first aid places these concerns towards oneself with a DIY mentality. Long-Arm Stapler First Aid brings together an assortment of zines and comics that address health-related issues ranging from mental to physical, personal to societal, and preventative to regenerative. These largely self-published works address, at times, incredibly personal experiences, usually with a large dose of wit. Unlike a film or a painting, readers of zines and comics are able to engage with these works at their own pace, choosing when they are ready to confront the next page. Perhaps this is what allows authors to broach difficult, and often very personal, topics with great breadth of emotion, honesty, and clarity. Through the combination of words and images, artists are able to rely on multiple modes of communication to bring together the tangible and the cerebral. Often the very act of making a zine is considered a therapeutic caring action. This exhibition of largely self-published works tackles self-care from many angles: health, grooming, food preparation, self-defense, coping strategies, defense mechanisms, mental or spiritual development and even soul enrichment. At their core these pieces suggest we must be our own advocates for our own health and well being. Long Arm Stapler First Aid will also include a limited edition exhibition zine, compiled by Liz Mason, encompassing relevant self-care themes in zines and mini-comics such as: heal- ing, grief, fitness, and medical issues, and a limited edition screenprint by Ramsey Beyer, published by Spudnik Press. In honor of self-publishing as a means to foster well-being, Spudnik Press is proud to host this exhibition featuring dozens of zine makers from across the country, including Edie Fake, Rinko Endo, Kathleen McIntyre, Ramsey Beyer, Liz Prince, Dina Kelberman, Sara McHenry, and more. Liz Mason is the manager of Quimby’s, as well as the editor and publisher for Caboose. Neil Brideau is comics artist and comics sommelier at Quimby’s, as well as an organizer of CAKE, Chicago’s Alternative Comics Expo. Posted March 20, 2013 by Angee & filed under Past. Victoria Martinez with Catherine Sollman, Courtney Sennish, Inah Choe, Julie Cowan, Malikah Fernandez, Peter Lutz, Elizabeth Kennedy, and a collaborative piece by Sean McKay and Pablo Philipps. On view in The Annex, Spudnik’s newly opened gallery and collaborative workspace, will be a juried exhibition entitled “Growth” as well as new work from Spudnik’s recent Artist in Residence, Victoria Martinez. In honor of their recent addition of The Annex (the third expansion in as many years!) Spudnik released an open call on the theme of growth. This exhibition takes a close look at the idea of metamorphosis in all its forms and celebrates exceptional work in the field of printmedia. The nine artists represented in this exhibition speak to the theme of growth in many ways, literally and figuratively – a change in size, number, significance, maturation, development, or identity. Growth artists include: Catherine Sollman (Chicago), Courtney Sennish (Providence, RI) , Inah Choe (Chicago), Julie Cowan (Evanston), Malikah Fernandez (Chicago), Elizabeth Kennedy (Chicago), Peter Lutz (Providence, RI), and a collaborative piece by Sean McKay (Chicago) and Pablo Philipps (St. Louis). Growth was juried by Jeannette Tremblay, of the Hyde Park Art Center, and Alison Kleiman, of the DePaul Art Museum. Kleiman also serves as the Vice President of the Spudnik Press Board of Directors. Simultaneously on view is work produced by Spudnik Artist in Residence, Victoria Martinez. 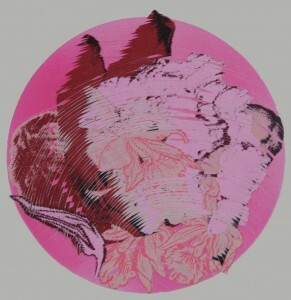 Martinez, who lives and works in Chicago, has created an edition of vibrant screenprints on paper. During her residency she created work based on the trips between her Pilsen apartment and Spudnik Press in the Ukrainian Village. Inspired by text, found objects and urban detritus, Martinez created ephemeral collages that give a second life and greater meaning to previously discarded materials. Posted December 5, 2012 by Angee & filed under Past. Daniel Mellis’s work explores the instability of language and the poetics of the philosophical fragment; the relationship between memory, photography, historical documents, and the inaccessibility of the past; the physical remnants of things now absent; and the combinatorial potential of letterforms through prints and artist’s books. His constant experimentation in a wide variety of print media including letterpress, offset lithography, and digital printing results in unified expressions of content and form. The show consists of four of his larger projects, some smaller works, and a print triptych created especially for the show at Spudnik Press. Posted December 1, 2012 by Angee & filed under Past. Public Reception: Thursday, January 24th, 4:30 to 7:30 p.m. The Gig Poster Project is a multi-faceted arts program engaging students with their communities through music and design. This fall, Teaching Artist Phil Parcellano and Poster Designer Johnny Sampson led a series of workshops in three Chicago secondary schools, guiding students through the process of designing a poster. On exhibition is the culminating artwork from all three campuses. From this astounding selection of work, 18 students will be awarded a screen printing apprenticeship at Spudnik Press Cooperative. One grand prize winner will be commissioned to design and print a gig poster for Mucca Pazza, the marching band that thinks it’s a rock ‘n roll band. 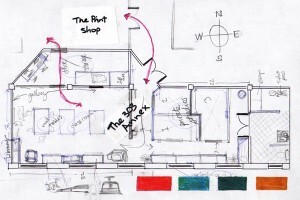 Please join us on January 24th for a hands-on printing demonstration, food, and celebration. Please contact Vanessa Smith at vsmith50@ccc.edu with any questions. Gallery hours are Mon-Fri 12 to 6 p.m.
Posted November 1, 2012 by Angee & filed under Past. Nine on The Prairie features visual, musical and theatrical work created on retreat at the Ragdale Foundation in Lake Forest, as well as notes and ephemera from conversations about teaching practice and artistic process. In August 2012, nine teaching artists came together in a two-week retreat to explore what it means to be both teacher and artist. Visual artists, playwrights and musicians were given ample time and studio space to pursue their individual projects as well as opportunities for collaboration and conversation. Each left the retreat with new works, new curricula, and returned to their home organizations (arts education pioneers Marwen, Silk Road Rising, and Old Town School of Folk Music) with new ideas about teaching and artistic practice. Reception is Sunday, Dec 2 from 5 – 7 pm and will offer live performances of new musical works. The show runs November 27 – Dec 4 and will include photographs, painting, embroidery, collage, video and audio. The Teaching Artist Residency was funded by grants from the National Endowment from the Arts and the Ragdale Foundation. Posted August 10, 2012 by Nate Beaty & filed under Past. “Walking is the best way for me to think. Walking in nature allows for a temporary repositioning from our daily lives. But I more often find myself walking on a city street, or meditating while surfing the internet. For me, both the internet and nature operate as an escape from reality.” says Daniel. Working in the form of block prints, drawings and monoprints, and using imagery found online, Daniel depicts the detail and expansiveness of green forests on or with materials made from wood. He hopes viewers can get lost in the details of the natural world, and at times, utilizes technology as a means to this end. Posted August 1, 2012 by Nate Beaty & filed under Past. In partnership with Spudnik Press, Polly Yates, the recent artist in residence at Spudnik, will have a solo show opening in early October. Posted July 31, 2012 by Angee & filed under Past. Hubbard Street Loft’s artists and art spaces will share their creative practices through exhibitions showcasing studio artists, demonstrations, refreshments, and music. 1821 Hubbard Street Lofts houses an array of Chicago’s best art-based businesses including Spudnik Press Cooperative, Platform Studios, Front Forty Press, The Post Family, Saverio Truglio, and more. By sharing what we do, we hope to better illuminate how we all work together to strengthen our community and the relationships we have with our neighbors. Spudnik’s newest addition, The Annex hosts a gallery and classroom, independent studios, and shared work space for writers, bookmakers, artists, students, and others. 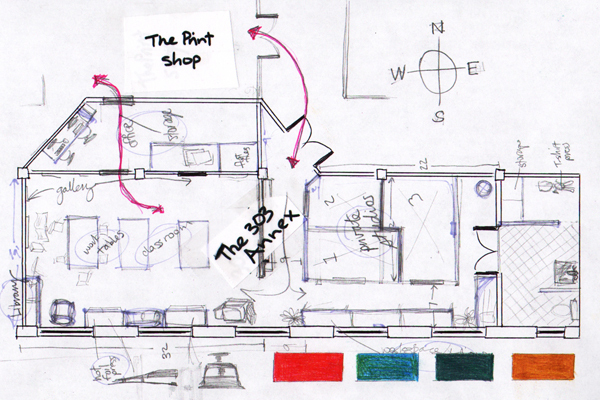 A reference library of small press and experimental book projects is under development. Working primarily in letterpress and relief, Brandy explores the psychology behind manipulative communication. 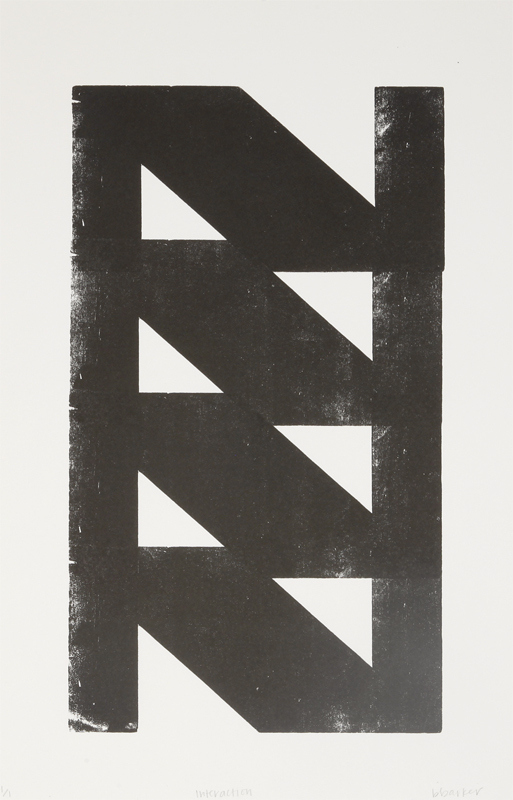 Role reversals and disorientation are two reoccurring themes in her print work, blurring the lines of recognizable letterforms and “new symbols” of communication. 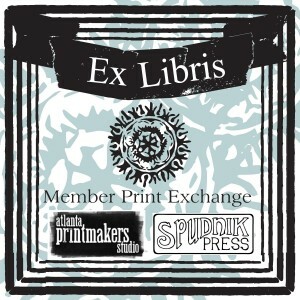 Spudnik Press is proud to announce an exhibition in conjunction with Atlanta Printmakers Studio. 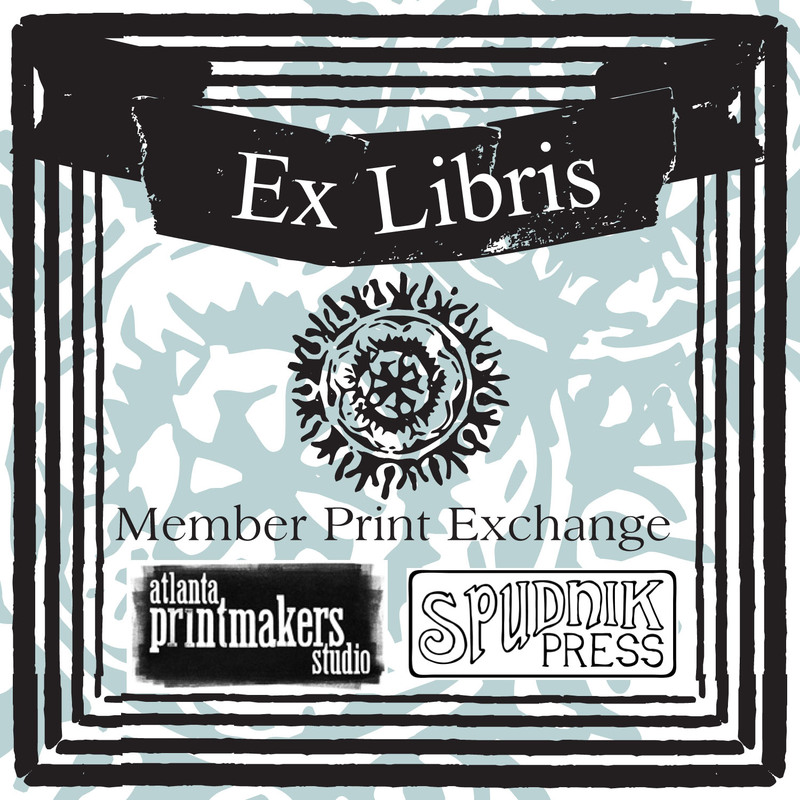 Additionally, Ex Libris is part of the Seventh Annual Chicago Calling Arts Festival. Bookplates were originally designed as small decorative labels pasted inside a book’s cover to indicate ownership. A long line of artists have been inspired and commissioned to design these miniature prints including Albrecht Durer, Hans Holbein, Aubrey Beardsley, Eric Gill, and Rockwell Kent to name a few. In the 19th century there was strong interest in ex libris collecting and society’s were formed to promote and commission bookplates from prominent artists. Bookplates served as evidence of prestige and status as well as important documentation of the provenance of books. The images often related to the interests, career and accomplishments of the book’s owner, a play on the person’s name, and ancient myths or fables. 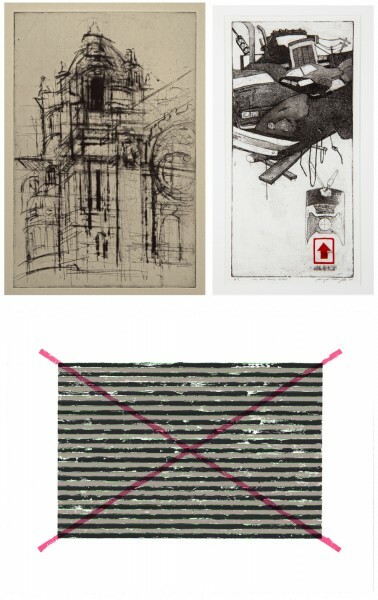 As Spudnik Press gears up to expand book and writing programming, and Atlanta Printmakers Studio present Print Big!, an event focused on books, reading, and literature, members of both studios have created new work that alludes to the rich correlation between the worlds of art, writing, and reading. Posted April 20, 2012 by Nate Beaty & filed under Past. 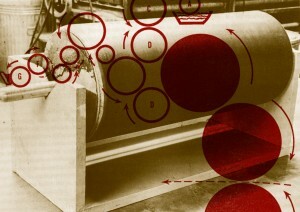 Lithography, simply explained, is a printing process that capitalizes on oil and water’s natural inclination to repel each other. Since 1796, Lithography has evolved from a process using grained limestones and leather rollers to high volume, multi-color presses. Spudnik Press has unique facilities, allowing artists are utilizing this medium for all it is worth. Traditional lithography captures nuanced mark-making, and is a terribly expressive medium. Offset Lithography excels at self-published zines and chapbooks, and has wide aesthetic possibilities. Recent work from our Lithography Department showcases the work that has been produced at Spudnik Press since we added Offset Printing to our repertoire. This show sheds light on how contemporary commercial printing methods grew from traditional lithography – that they are not too dissimilar at all! Brandy Barker, Kelsey Donahue, Caitlyn Eakins, Edie Fake, Sarazen Haile, Angee Lennard, Morgan Sims, Aaron Smith, and others! Posted March 22, 2012 by Nate Beaty & filed under Past. A contribution furnishes something towards a result. “Contributory” is a juried show dissecting the parts that create the whole, the chain of events that leads to a result, good works that build communities, and the symbiotic nature of a contribution. “Contributory” reflects on what and how people, the natural world, and technology proffer with intention and purposefulness, or despite themselves. Julia Vodrey Hendrickson is a visual artist, writer, print-enthusiast, and curator. She recently released a poetry/artist book called Grow No Moss, printed at Spudnik Press. Primarily based in Chicago where she is the gallery manager at Corbett vs. Dempsey, she is currently pursuing an M.A. in Art History at the Courtauld Institute of Art in London. Images (above, clock-wise from left to right): Cathedral by John-Mark Schlink, Cars and Trucks: Inject by Jennifer L. Mazella, I Guess Not by Randy Clark. Posted March 21, 2012 by Angee & filed under Past. Join Homeroom Chicago and Spudnik Press to celebrate the release of Ten x Ten. 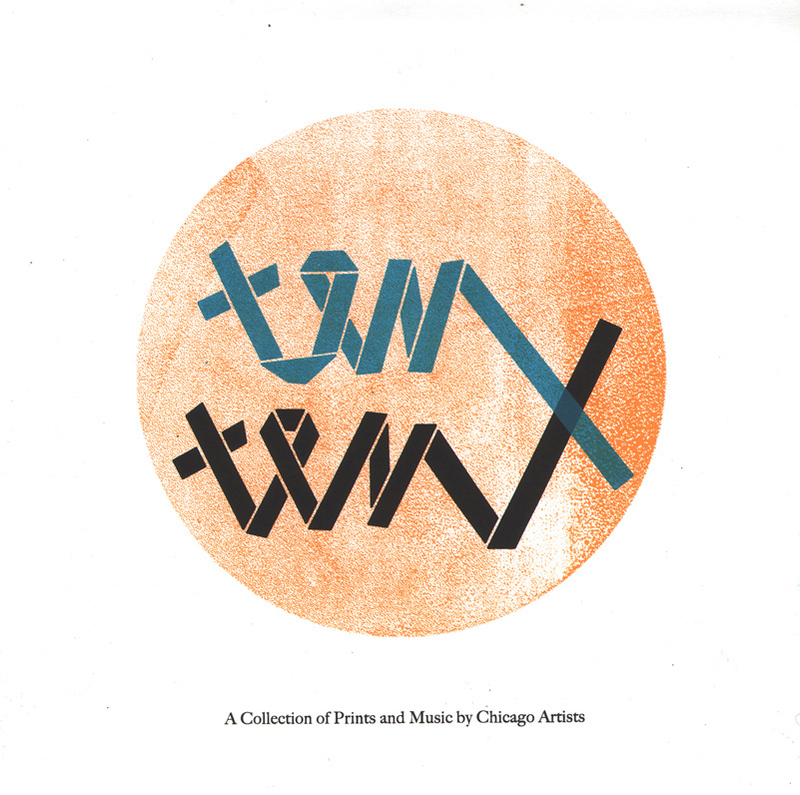 Ten x Ten is both a compilation and collaboration between Chicago bands and printmakers. The project strives to introduce artists and musicians that might not have otherwise crossed paths, and encourages the development of creative relationships between Chicago bands and printmakers that go beyond show posters. The final package consists of ten songs accompanied by ten corresponding prints that were developed exclusively for the project.